Postoperative urinary retention can be a serious complication after laparoscopic inguinal hernia repair. With an incidence ranging from 0.2% to 30%, it is a multifaceted problem and may occur as a result of physiologic changes associated with age, gender, pathologic conditions, and alterations of the micturition process via excessive intravenous fluid administration, general anesthesia, and medications to control pain postoperatively. Although the diagnosis of retention can be challenging, identification of retention and treatment with in-out catheterization within 2 h after surgery prevents most long-term problems associated with this condition. 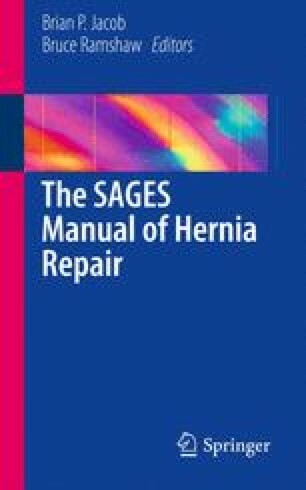 Surgeons performing laparoscopic inguinal hernia repair should remain vigilant in considering its diagnosis and remain familiar with the evidence supporting its treatment.